When the U.S. Fish and Wildlife Service announced rule changes for the 77-million-acres of National Wildlife Refuges in Alaska on Aug. 3, changes the Sportsmen’s Alliance vehemently opposed for many reasons, what we witnessed was a wholesale power grab by the federal government to usurp states’ rights – a move that will undoubtedly not be limited to Alaska. What we saw immediately after the announcement was wholesale hypocrisy and spin by Dan Ashe, Director of the U.S. Fish and Wildlife Service. 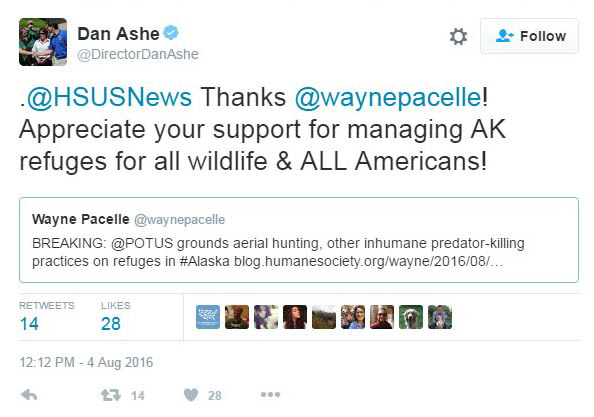 USFWS Director Dan Ashe Tweets his thanks to Wayne Pacelle and HSUS. 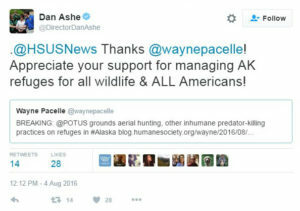 Ashe, who was appointed by President Obama to lead the FWS and the scientific management of wildlife life in this country, immediately Tweeted his thanks to Wayne Pacelle and the Humane Society of the United States for their help in making it happen. HSUS’ spin on the entire rule changes centers on aerial shooting of predators by the government and the trapping and hunting of apex predators, such as wolves, coyotes and grizzly and black bears. Emotional grandstanding which to bang the fundraising drum no doubt, but the crux of the argument for both Pacelle and Ashe is exactly what makes this move hypocritical. Both Washington, D.C., residents argue that wildlife belongs to all Americans, and therefore the voice of all Americans should be represented in how Alaska manages federal lands within its borders. Wildlife does belong to all Americans, but is entrusted to the goals of state fish and game agencies to manage in accordance with the wishes of its residents. We don’t purchase a federal deer license that’s reciprocal in all 50 states; we purchase a non-resident license, often at higher prices than residents, for the privilege of taking an animal there. 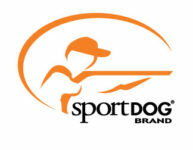 We also don’t have a national management program for deer, pheasants, elk, turkeys or any other wildlife. That management is left to the states. Further, this wasn’t a move reflective of the voice of any American, much less all Americans. It was a bureaucratic move by a federal agency backed by a special interest group (one who 98% of Americans disagree with their ultimate agenda). If Ashe and Pacelle were being honest with their Tweets and blogs, they’d say what these rule changes actually were: a successful usurpation of power by the federal government to advance an anti-hunting agenda in the bulwark state for hunters’ rights; an offensive move that will allow them to invade Western states and assume control of large swaths of federal public lands to eliminate hunting, trapping and other management methods with ease. To take it further, it begs the question of what exactly is FWS’ position on apex predator management. In one breath FWS has made sweeping rule changes to eliminate their management in Alaska and to silence the public in the act. In the next breath FWS stands with the Sportsmen’s Alliance in a lawsuit to return wolves throughout the Great Lakes to state management. A conflict of interest, no matter how you look at it. What we have here are two Washington, D.C., suits who talk out of both sides of their mouth. Something that comes naturally to those inside the Beltway, but which is dangerous for those who have to live with the consequences of their agendas.